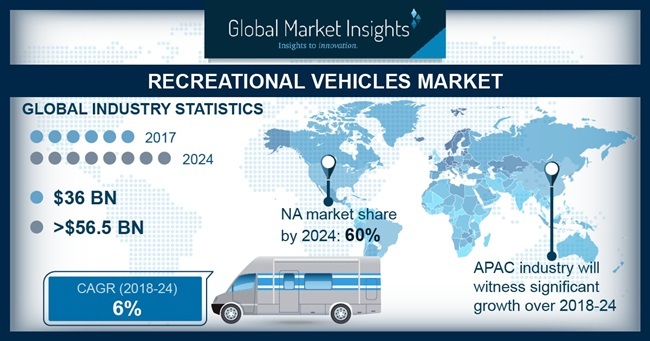 Recreational Vehicle Market size is estimated to reach USD 56.5 billion by 2024; according to a new research report by Global Market Insights, Inc. The proliferating customer spending on recreational and tourism activities will boost the recreational vehicle market share over the forecast timeframe. Increasing recreational vehicle parks along with the introduction of several customized facilities for RV owners to enhance their camping experience is further strengthening the recreational vehicles business generation till 2024. Industry participants are actively involved in introducing innovative technical features in their product portfolio for enhancing the appeal of their vehicles. Introduction of high-end infotainment systems with integrated navigational facilities and improved communication systems including Apple CarPlay and Android Auto is providing a positive outlook for the recreational vehicle (RV) market growth. For instance, In July 2018, Thor Motor Coach announced to launch Miramar 35.2 motorhome with updated stylings, solar charge controller, Wi-Fi extender, and advanced exterior entertainment system by 2019. Motorhomes segment is estimated to account for around 60% recreational vehicle market revenue share over the forecast timeframe owing to the benefits offered including enhanced interior space with facilities including beds, kitchen, sink, and bathroom. The lower interest rates along with easier piloting and camping capabilities with electric jacks and hooks supports the product proliferation till 2024. The gasoline RVs segment showcased a significant growth rate of over 7% CAGR over the study timeframe owing to the multiple benefits offered compared to the counterparts including easier fuel availability, lower maintenance and acquisition cost. The lower emissions from the gasoline recreational vehicles along with improved performance in high altitude and cold weather conditions, coupled with superior power and speed capabilities provides a positive outlook for the RV market growth. The higher cost associated with the acquisition and maintaining of the recreational vehicles may hamper the recreational vehicle (RV) market growth over the projected timeframe. The costs associated with the refilling of gas for power generators, insurance, and road tax are steep and contributes significantly towards increasing the overall recreational vehicle operating cost. Manufacturers are continuously working on lowering the vehicle weight by introducing light weight innovative chassis made of composites, fiberglass and aluminum, improving the vehicle efficiency extensively. For instance, in July 2018, Airstream introduced the Nest RV made of fiberglass body with significant weight reduction compared to the counterparts. The recreational vehicle market share from towable RVs segment will capture the maximum volume share of around 74% till 2024. This dominance can be attributed to the easier maintenance and operations. The availability of several models at varied price range coupled with lower depreciation compared to the motorable RVs is further strengthening the segment dominance. Diesel recreational vehicles accounted for over USD 12 billion in 2017 and will grow considerably over the forecast timeframe. This can be attributed to the higher fuel efficiency offered by these vehicles. The rear engine configuration enhances the cooling efficiency and limits cabin noise significantly, enhancing the overall vehicle comfort. The superior torque output from diesel engines facilitates driving in steep inclines supporting the RV market proliferation till 2024. North America and Europe contributed to around 80% of the global recreational vehicle (RV) market. High growth of the recreational vehicles in these regions can be attributed to high average disposable income of the population that allows the consumers to invest in luxurious recreational vehicles for outdoor activities. Moreover, few people owning RVs utilize them as full-time residential facility, allowing them the mobility and facilities of residence. Growing consumer interests in touring and other recreational activities such as camping, sight-seeing, new destination exploration, etc. are expected to present favorable growth prospects through the forecast period. Major industry participants in the recreational vehicle market include Thor Industries, Winnebago Industries, Forest River Inc., and REV Recreation Group. Major operations of these companies are centered in North America, specifically owing to largest consumer base located in the region. Mergers and acquisitions are among the prominent strategies adopted by the participants to enhance their industry share. For instance, in September 2018, Thor Industries announced the acquisition of Erwin Hymer Group for USD 2.4 billion to complement its product portfolio with a diversified range of RVs at varied price range.